Rings is a temporary site specific environmental artwork that was inspired in part by the W.S. Merwin prose poem Unchopping a Tree. In the writing, the author gives instructions for putting back together a tree that has been cut down, an impossible task. The written description becomes a metaphor for human intervention into the landscape, the ecology of natural systems, and our impact on the natural world. What we have taken away or altered can rarely, if ever, be replaced or repaired to its original state. 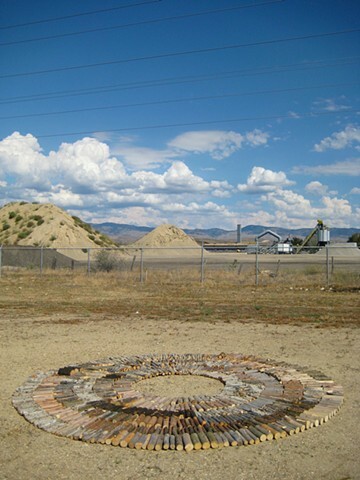 The overall shape and multiplicity of textures becomes a visual element in the landscape – to be looked at from a variety of vantage points in a relationship to the human and natural elements that surround it such as the concrete plant and the WaterShed facilities as well as the nearby foothills, trees, land, and sky. The project is supported by the Boise City Department of Arts and History and the Boise WaterShed with assistance from the Boise City Community Forestry Department.